The Hood River Fruit Loop, meandering through the famed orchards of the Hood River Valley, is 35 miles of golden delight—enjoy fresh local fruits, wine-tasting, festivals, and delicious homemade products here. 35 mile drive through orchards, farms and lovely villages just an hour from Portland, Oregon; historic train ride, restaurants, winery, golf course, shops and more. Located just few miles away from Hood River Valley, Serves quality fruits, pears, and Asian Pears. Rasmussen Farms is your online premium produce vendor. Located in Mt. Hood, Oregon, Rasmussen farms provides the healthiest and best-tasting fruit available on the market. Join the Fruit Loop at Exit 64 from I-84 to the Mt. Hood Scenic Byway (Highway 35). 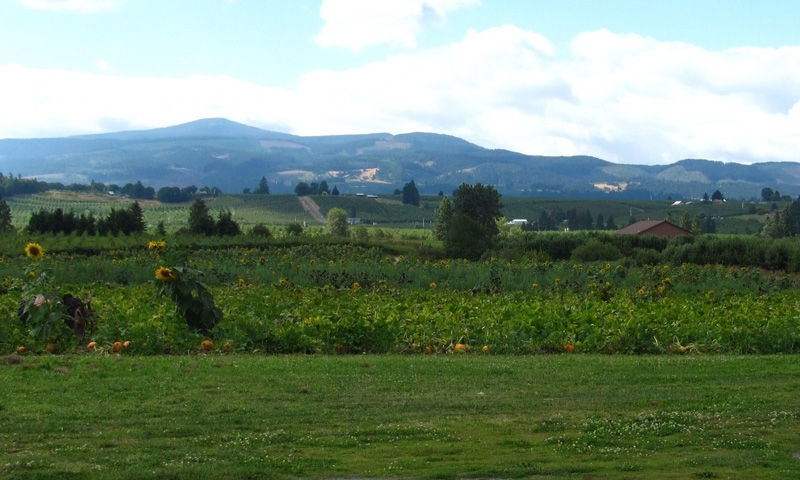 Enjoy 35 miles of fresh fruit stands, blooming flowers, wineries, country shops, and festivals. Obtain more information and a Fruit Loop map at the Hood River Visitor’s Center near Exit 64. The Hood River Fruit Loop is a 35-mile past more than 30 local orchards and fruit farms. Visitors to the Fruit Loop have access to some of the best pears, apples, cherries, peaches, berries, and wine in the country. Purchase fresh fruits of the area at local produce stands, or choose U-pick to gather fruit right off the tree. Homemade pies, jams and preserves, wines, crafts and artwork by local artisans also highlight the Fruit Loop drive. And orchard owners host festivals to celebrate the peak seasons of each regionally-grown fruit. The Fruit Loop is located about 60 miles east of Portland, Oregon near the scenic Columbia River Gorge. Visitors can reach the Loop by taking Exit 64 off Interstate-84. Maps, directions, and information are available at the Hood River Visitor’s Center located near this exit. The Fruit Loop follows Highways 35 and 281 for 35 miles. At least 32 privately-owned farms and orchards dot the route, and most are open to visitors, so plan plenty of time to sample, shop, and enjoy the area’s products. The Gorge White House, a historic Dutch Colonial home open to the public.